Bless up Ase Ire fam! SO, I was at the library and happened across a book of wealth affirmations on the $2 book table (one of my favorite places in the world). 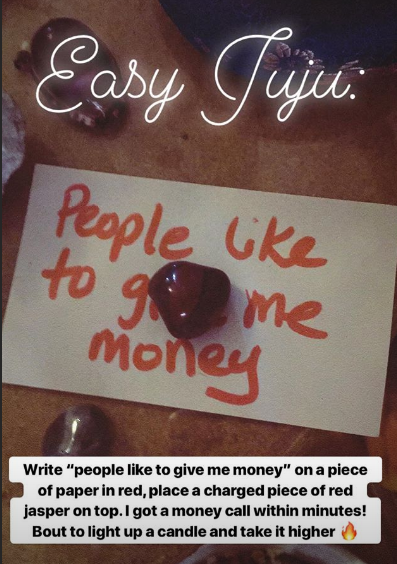 I flipped to a random page (a type of divination itself) and found this mantra that I had seen before: People like to give me money. I had to run, so didn’t read the whole explanation behind it, but it immediately resonated with me and I filed it away in my brain and spirit. When I got home, I felt deeply moved to write it on a card in red and to place it on my crystal table with a piece of red jasper on top. I concentrated and repeated it aloud. Can I tell you I literally got a text from someone wanting to give me money within a few minutes?! Before I even had a chance to light my candle. The vibrations are HIGH, I tell you, and I love it. I’ve lit a candle with it and I’m gonna leave it working for a while! (30 days is a good time to leave up any work you’re doing, a full cycle of the moon, more on that later). Give it a try with deep intention and see what happens for you. Here’s the important thing: I’m not guaranteeing this will bring you money instantly (though I pray it does! ), but let’s go deeper understand that this particular mantra is powerful is because it helps to shift our emotions around people giving us money. I want you to stop for a moment and connect to how you feel when you think about people giving you money for any reason, especially if you have a business. When we charge for our services, or ask for money, we often think we’re imposing on people. We think they don’t want to part with their money, or that we’re creating a burden by asking them for it. The truth is, though, people love to spend money! In fact, they only feel bad about giving up money when they feel they haven’t gotten anything of value in return. If you have something people want or need, they are not just happy… they’re THRILLED to give you their money to get it. So a part of shifting the mindset is to understand the value of what we are offering, whatever that is. And if we don’t feel it has value, then it’s important to stop and assess that feeling, too. I KNOW that spiritual guidance is valuable. It’s invaluable, really. You can’t put a price tag on knowing what to do and how to make choices that align with your personal destiny to get you to true happiness in life. As is evidenced by the unfortunate demise of people who seemingly had it all and “should have been happy,” from the late great Whitney Houston (who is recently in the news due to the distasteful picture business) to the recently departed Kate Spade, money alone isn’t magic. That money has to be carefully traded for things that have true value. Deep experiences. Plane tickets to new places. Spending time with family. Libations with friends. Divination. Ritual. I happily spend my own money on spiritual tools and consultations, and I know that my clients are more than pleased to spend their money with me because they walk away with something that money really can’t buy: a message from the Divine to enhance their existence. How much is that worth? Connecting with spirit and being entrusted with people’s personal information and transformation isn’t a small thing. I take what I do seriously and I am joyful and deeply humbled to be able to do it. I hope you feel the same way about the things you do! (If not let’s talk about it and figure out what else it is you should be doing.) I also understand the value of what I do, and pray that you understand and accept the value of what you’re offering and always remember: people love to give you money! So don’t feel bad asking for it. While you’re asking, try this easy juju to ask the universe and let me know how it goes! Blessings! Red Jasper is a stone of high energy and is called the “warrior’s stone.” It connects to the root chakra which is where a lot of our apprehension about money comes from. I believe this is why my spirit guides led me to use it for this. Hi Gladys! Sorry for the delayed reply to your question. I wouldn’t think of it as having done anything wrong per se, sometimes energies just don’t quite align the way we’d like. Try it again or try some other rituals and see how they work for you. Blessings! Thank you! I will be doing this today. I will use green aventurine as I don’t have a red jasper. Awesome, please let me know how it works for you. Remember you are the magic! Thanks for reading! Previous Ask a sista FIRST!